Um, I'm at a loss for words. Hobbit feet are fine on Hobbits but...? I love your number one through eight. Number seven had me laugh out loud. Ah. I compared the Hobbit feet to the Celine furry shower shoes. They look a lot the same to me. Oh well, you win some, you screw some up! Good to hear from you anyway! Hey Jan, So sorry I forgot to check back for your always witty reply last week. I did indeed understand your comparison my friend. My loss for words was referring to those dang shower shoes. What were they thinking? Fur is fine on a hobbit's foot, but in a shower shoe? Eeewwww ten times over. You are the kindest woman in the world. I misunderstood you as well, but I am completely capable of being unclear! Do you know, I saw another picture of the furry shower shoes in this Month's Bazaar ... $860 !!! I am in the WRONG business. How fabulous that you have an avatar AND I love what "Janime" is wearing! I whine a lot about how I look in photos, and this is a solution that I hope will be appropriate. I'm doing it for a lot of reasons, one of which is to participate in community in a way that's easier on my self-esteem. I worry a bit that it's cowardly to hide behind my alter-ego when other, braver women put it all out there in a more honest way. But mostly ... it's fun, so I'm glad you enjoy her. Jan, you are so so funny! I need to go to bed, but here I am reading your post! A great post Jan. In so many points I agree with you. I like Janime's Hobbit outfit, especially the Breton Tee. We saw the film last week, it was fantastic. However I would not try Hobbit shoes I think. But I agree with you we will soon see more of them. I hope we are both wrong! Wasn't The Hobbit wonderful? One of our friends is in New Zealand, having done some post production sound for the trilogy ... I was so thrilled to see his name roll past on the credits! Thanks, Sabine, for reading and writing! So glad you got smiles from my goofy post. You are quite right when you point out that sometimes all there is left is to laugh. The laughs have been hard to come by for so many this year, so I'm happy to provide any that happen. Have a great week, and thank you for reading and writing. Fantastic post! Especially cheering points 4 and 5! I await to see how many of the fashion forward adopt hobbit feet for spring. I get it that runway is not always literally translatable to the real world, but you know I'm right about the DYI victims that will be out and about soon. My guess is that in your travels you may not see them often, but I can just about name a few people I know who are already grabbing the glue-gun. Some things just can't be un-seen once you see them, you know? Seriously, thanks for reading, and keep writing your blog ... we miss you when you're gone! I love your #6 realization and had the same one in 2012 (which is why, in part, I started blogging). Janime? That has to be the funniest thing I've read on a blog in a long time! 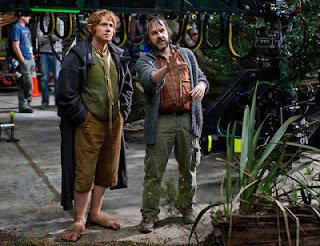 Gotta get me some of those hobbit shoes, they look comfy. Ha! I absolutely dare you to post a blog with you wearing them. No? I thought not! All kidding aside, thanks for understanding that it's supposed to be funny. Glad you like Janime. She is evolving. My new hobby. Stay well, and keep writing your blog, please. I really enjoyed reading your great post and agree with most of your points, especially #4! It must be a tween responsible for the wear-as-many-prints-as-possible-at-the-same-time trend of last year. 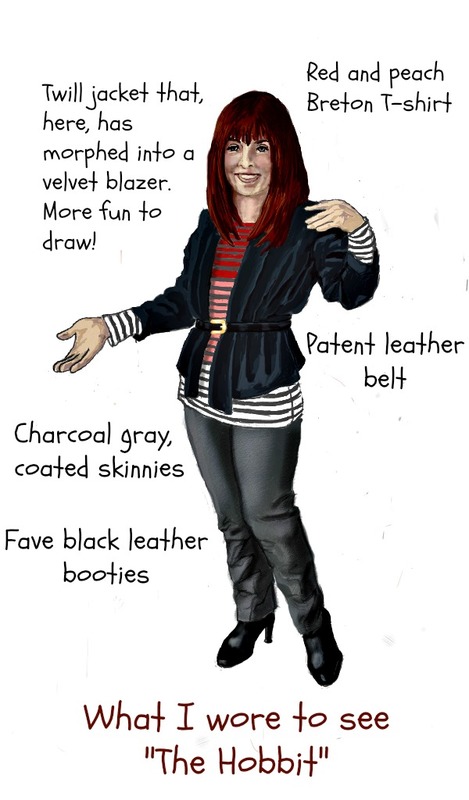 Love your outfit and illustration! So glad you had some fun with my silly blog. Yes, the print mixing thing as well. It's hard to ignore the voice we've heard all our lives ringing in our heads, screaming, "YOU CAN"T WEAR THOSE PRINTS TOGETHER !!!" I get rule breaking, but complete anarchy in this case becomes a whole book of fashion 'don'ts". Thanks for reading, and glad you like Janime ... she's evolving. There a lot of shapes and cuts that don't fit me, but I have come to realize that jewelry is a great way to keep up with fashion. Ohhh - I would not mind to wear those sandals - they look so comfy! You look much better than you think, kiddo. But yes, jewelry is a great way to keep things fresh. My go-tos are shoes and handbags. Please, if you wear the furry shower shoes ... keep them at home. Or, if you wear them out of the house, make sure to feature them in a blog post! Keep writing, congrats on your 200 ... looking forward to seeing much more this year! You are such an excellent writer. I enjoyed this post so much. I am with you on all of the list especially 4 & 5. I saw those shoes too and wondered WTH? I like a nice cosy shoe, but those are something else. I'm glad you got a kick out of my goofy post. And I'm so flattered that you like my writing. Means a lot coming from you, because I always look forward to what you're up to. Yours is one of the first style blogs I really followed, and your style influences mine a lot. I often consider: WWDD? Have a great week ... smooch Harry for me, please. Totally agree with Debbi, you are an excellent writer. Thank you for giving me a laugh today. Couldn't agree more with your list, especially #4. Just yeaterday I was watching a program on a local tv station where they had a stylist giving her advice. She proceeded to 'tell' women how they should wear a chambray shirt in their 20's, 30's, and 40's. Then how to wear skinny pants and blazers. She kept referring to and reminding us to dress age approriate. I seriously wanted to kindly slap her (since she was obviously in her early 20's) and in my eyes had a long way to go before she could relate in giving us advice. Now I can remind myself to not take them too seriously. Glad you got a laugh! I hope to entertain. Another peeve along the lines of the baby fashion pundits: Elizabeth Hasselbeck presents a fashion segment on "The View" on how to put an outfit together for under $100. I find it really condescending, because every woman I know already knows how to do this ... we do it daily. I'm getting crabby in my old age, I think! Glad I'm in good company, though ... at least in ignoring the young whippersnappers! Thanks for the kind compliments. I'm really enjoying your blog as a new reader, and look forward to what you come up with in the new year! Wow! I've already copied, printed and taped the first two sentences of your comment on to my bathroom mirror so I can see them every time I go searching for age-spots! So kind, Sarah! And so glad you agree about the furry shower sandals. Comfort is over-rated. Harrumph. Thanks for reading me, Sarah ... looking forward to what you present next! I could've sworn I commented on here, but it's nowhere to be seen now. Such a great post, I had to come by again! I had said I especially agree with #8. But I must say I'm a total wear-er of all kinds of prints together and look just fabulous doing it, thank you very much. Love your evolving Janime. Can't imagine how you've done it. So creative. Sorry that comments are disappearing into the aether! It isn't you ... something is amiss. I'm asking around to try to fix it. Yes, you do look fabulous in your mixed prints ... and I envy that ability. It's the old rule book that the voice in my head quotes so frequently that I find difficult to silence. When I look at your mixes, they seem informed and considered in some way. There's that sometimes ineffable quality that makes some combinations *work* ... once I see what you've done I can sometimes suss out what you've done. In spite of the anarchistic feel of print mixing, I'm guessing that there's a formed aesthetic somewhere in there in the best examples. Or not. I could be wrong ... I am so often that I'm used to it! I'm getting such a kick out of the ability to carrying every art tool I could imagine around with me in the form of a stylus, tablet and a single $4.99 app. All new things to try, and Janime gets the brunt of my new obsession. So happy you like her. Thanks for stopping by for a second try. I appreciate it. Ha ha ha at #4! Thanks Julee, stopping by and I'm glad you got at least a little laugh. Oh, by the way ... can I see some ID, please? While I wouldn't accuse you of being whippersnapper, you are not old enough to be in the Ancient Girls club. Lol what a funny post!!!! And the illustrated avatar is super adorable!!! So kind, Elena. You are surely one of my inspirations. I'm about to get a new tablet that will take Autodesk Sketchbook Pro, and I'm excited to gain some new skills. Little Janime is a work in progress and still evolving. She'll look different every time for a while! Hey Jan, I am uncertain if you received my reply to your comment. You did indeed make yourself clear with respect to comparing hobbits' feet to those furry shower shoes. My loss for words was a response to looking at those dang shoes! You write with great care and humor and I shall endeavor to write my comments more clearly and succinctly. Yes, just noticed it and replied. You're so patient. NOT to worry ... I am (in)famous for being long winded, so I tend to go on and on. Not great for clarity. You are beyond nice to comment at all ... thanks for your concern, but we're absolutely on the same page. I'm so excited about getting a new, much bigger tablet (memory wise) with a program that I cannot wait to try. It's like walking around with my entire studio in my purse. Never thought I'd live to see the day! Hilarious! I noticed the Birky nod, but Hobbits? Now I like 'em! Saw today in this month's Bazaar ... Celine is selling these furry shower shoes for $860, plus change. No, really. My car is not worth that. My car and my husband's car put together. We have crappy cars, granted, but these are some homely shoes. Glad it made you smile, though. My dear!! I skipped to the end of the comments so I wouldn't be influenced by others' opinions. YOU are hilarious, thoughtful, and smart. I have to confess that Arkansas has taken on a new light for me, thanks to you. Yes, I'm sadly narrow-minded about the great USA, but you've broadened my horizons, as they should be. God knows, I live in freakin' Georgia!! I'm quick to explain I'm not from here, but you know? Times they are a changin'. (Thank you Bob Dylan!!) Keep blogging, keep enjoying life and sharing your insights. Pretty soon, you'll put Arkansas on the map for all those hipsters who need to move on!! Sending much love!! .....J.
Oh, no, Baby Girl. You were right the first time about Arkansas. We are the most fly-overable state. Georgia at least has the grace of ol' southern hospitality. Arkansas just has rednecks. The local high-school mascot is (... and I swear to God I would not lie about this...) The Ozark Hillbillies. We don't ever let anyone think we're from here ( I'm a California girl and Dan is from Colorado) and I hate going out of state in my car with Arkansas on the license plate. The times may be changing but not fast enough for me. All that said, so glad you like my bloggy stuff, and thanks for reading. You're a delight, Jean. I love your avatar. Wouldn't mind one myself but one of me is more than I can handle! Your list is dead on. We have to have the knowledge in order to make the decisions for ourselves. Just once I would like to see all of a seasons trends in one outfit! Wouldn't that be hilarious? Thanks for your encouraging words. Now there's an avatar project. I could do that ... maybe for spring! Know you're all back in work stuff, and we're all cheering you on. You and Debbi where among the first blogs I saw, so thank you for including me in your comments. Have a great week, and keep getting better. And better until you're all well and running around on the highest heels you want! I won't be heading back until sometime next week. I have a meeting tomorrow afternoon and I'm a nervous wreck! Thanks for reading my blog. I've made a few friends along the say and it helps me to think things through.......not always to the right conclusion!